Every inventor has to start somewhere, and one of the greatest innovators in our history was no exception. Ben Franklin developed his first invention while doing what he loved best: swimming! Ben’s Big Splash is the story of Franklin’s first invention, his journey through the scientific method, and the surprising successes that result when you’re willing to make mistakes. Barb Rosenstock’s rhythmic, whimsical style is the perfect complement to S. D. Schindler’s pen and ink and watercolor illustrations. Together they recreate history in an engaging and unique way. Both author and illustrator worked closely with Franklin experts, and the book includes Franklin quotes, an extensive author’s note, timeline, and bibliography. Benjamin Franklin was an incredible man who contributed greatly to society, including inventing many items we still use today. This book references Franklin’s invention of swim fins and swim sandals. Another of Franklin’s inventions, bifocal glasses, changed the way people see then and today. 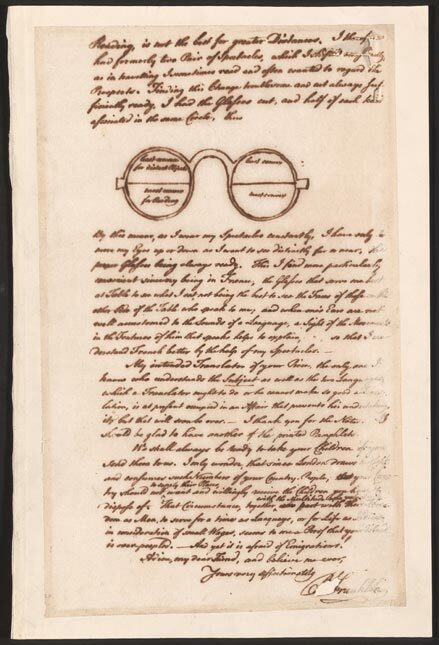 Invite students to analyze the manuscript Franklin created showing his invention of bifocals. Explore other primary source resources in the Library of Congress Benjamin Franklin collection. For a transcript of a letter written by Franklin directly referencing swimming, visit the National Archives website. How much of the text can you read?